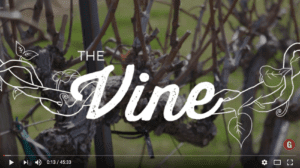 Grace Bible Church visits Messina Hof Winery for an explanation of the Vine Tender’s role in the vineyard. Listen to this powerful sermon and view footage featuring Merrill Bonarrigo starting at 27:06. Just as a branch can only bear fruit when it remains attached to the vine, so we can only live in a way that pleases the Father when we remain closely connected to Jesus. A sermon from Grace Bible Church in College Station, Texas given by Brian Fisher on the Anderson Campus.